A new crime thriller from Hong Kong auteur Johnnie To should get you excited. The 61 year-old director of “The Heroic Trio”, “Exiled” and “Drug War” (to name just a few) is a master at impressively choreographed action inhabiting compelling characters in absorbing stories. His latest is “Three”, a taut thriller that has his signature style and takes place entirely in one location, utilizing the environment and situations in a clever, intense and even humorous manner. While its not wall-to-wall action, the build-up here is impeccable, asking viewers to guess who is good and who is bad, while causing them to scour every frame for clues that will reveal more about the curious characters and plot. 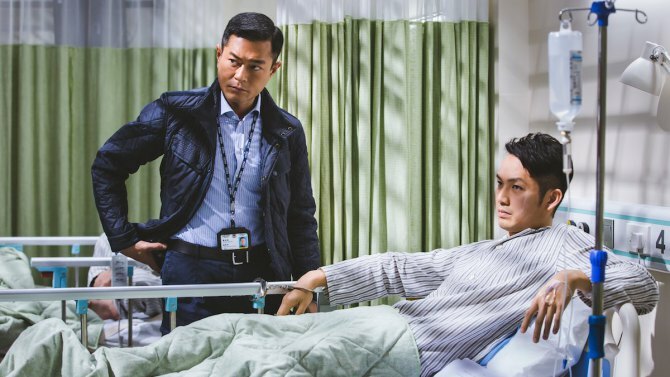 The title of To’s latest film refers to the story’s three main characters – brain surgeon Dr. Tong Qian (Vicki Zhao “Red Cliff”), police Inspector Chen (Louis Koo “Drug War”) and criminal with a bullet in his head (Wallace Chung “Monster Hunt”) – all of whom are unexpectedly pulled together in a trauma unit of a Hong Kong hospital. They withhold their own baggage, which majorly plays into how they go about what they’re setting out to do. The film’s Chinese title is translated as “Three People Walking, which is taken from Confucius’ “Analects” that states, “Among three people walking, there’s bound to be a teacher,” meaning, you can learn something from anyone. Although these are three totally different people, when they come together due to extreme situations, they study each other thoroughly which finds their abilities, morals and agendas put to the test. The story opens with a focus on Zhao’s Dr. Tong, who is going from one stressful medical situation to the next. After she left one young patient (Jonathan Wong) paralyzed from a risky surgery, her supervisor Steven (Eddie Cheung Siu-fai), should’ve sent her home, but then performs another high-risk surgery which leaves a distraught woman’s husband in a coma. Both of these unfortunate patients remain in her ward as their condition is monitored, leaving the paralyzed patient to verbally berated by the unrepentant and empathetically cold doctor, who is convinced she took appropriate measures during each surgery. This is where the screenplay by Yau Nai-hoi, Lau Ho-leung and Mak Tin-shu, cleverly sets up important characterization for the doctor that will play an important role once the other two characters are introduced in a few moments. To and the writers are careful to familiarize the audience with who we’re to follow and the environment we’ll be placed in for the rest of the film. About that time Chung’s wounded criminal is brought in by a police squad led by Koo’s no-nonsense Inspector. Upon an examination by Dr. Tong, it’s determined that the bullet lodged in the handcuffed patient’s head has to be removed in six hours, but Chen (who has his own ulterior motives) wants to know where his jewelry robbing accomplices are. We soon learn that this spry criminal purposely shot himself, while cornered by police, causing them to hospitalize the criminal, where he stalls doctors and officers with quotes from Hippocrates, Bertrand Russell and Leviticus 24, in order for his crew to orchestrate a break-out. 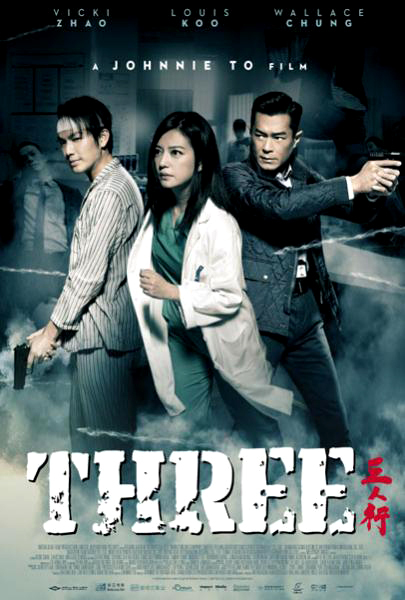 Caught in this psychological game of cat-and-mouse between cop and robber is Dr. Tong, who is surrounded by her mistakes and must determine if she follows her Hypocratic Oath and put the well-being of her heavily monitored patient or assist Inspector Chen in some manner which could save even more lives. 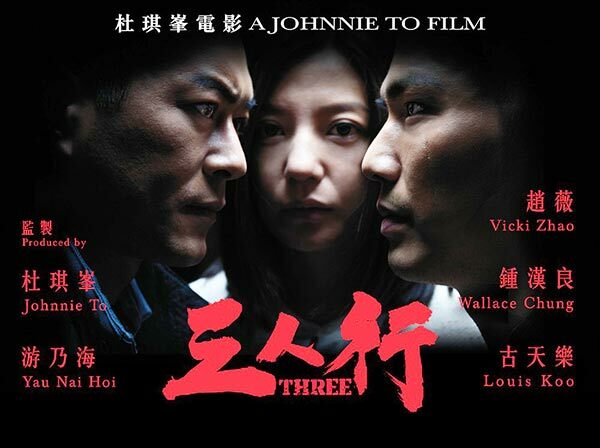 “Three” isn’t just an action crime thriller concerned with provided us with tight cinematography by To’s frequent collaborator Cheng Siu-keung and lean editing from David Richardson, it actually presents some real moral dilemmas for these three fallible characters, making us believe that the outcome could really go any which way. Although this is an intense film, To brings to a certain degree of needed quirky humor that disrupts the stressful tone. He does this by populating the hospital ward with a supporting cast of comical and carefree patients. There’s a computer geek (Timmy Hung) who’s glued to his laptop, unaware of his surrounding and only concerned with making sure his device remains charged. There’s also a slap-happy old man (Lo Hoi-pang “Life Without Principles”) who delights in pranks like taking the key out of every drawer he finds as he wanders the hospital. Characters like these two distract our main three from the criminal’s covert reinforcements (Micheal Tse and Raymond Wong) that begin to threaten the situation as the story unfolds. To balances it all exquisitely, like a conductor guided an orchestra through a complex piece, he manages to go from laughs to dire moments that inevitably erupt into a symphony of slo-mo violence. While the climactic whizzing bullets of the memorable third act are dizzying (apparently taking months to create), what is unforgettable are the bloody scenes of brain surgery on the operating table. If you’re queasy at the sight of scalpels digging into an opened skull and the prongs that hold it in place, these will be graphic sights that may cause some discomfort. To is known for his ballet-like style of shooting action, yet his camerawork during surgery is just as provocative, if not more considering the stakes. There’s a good deal of understandable hospital anxiety. The convincing cast that make up the trio offer an impressive variety of range of acting, preformed by some of the more well-known actors . Veteran actress Wei Zhao conveys a driven, yet over-confident character who succumbs to the stressful ‘life or death’ decisions that come with her profession with the arrival of the criminal. As Inspector Chen, frequent To actor, Louis Koo probably has the potentially most one-dimensional role, yet he brings a sharply focused intensity to the character that is fascinating to follow. The fact that the writers didn’t give his character the overtly ‘corrupt cop’ we see too often in American films is refreshing. Most impressive though is Wallace Chung, an actor who is something of a heart-throb in China as well as a poster, who has a blast with a smartly written psychotic character that will upset any preconceived notions they may have about the film’s antagonist. If To’s film has any flaws at all it could be that the hospital itself feels like it was made just for the film. It doesn’t feel very lived in or the kind of bustling hub of urgency and drama we’re used to seeing on film. This kind of makes sense when I learned that the main shooting took place in a hospital built by a props team in Guangzhou, capital of South China’s Guangdong province. These observances never took me out of the story, since I was already quire enraptured by all the characters and their perilous situations. If Hollywood were to remake “Three”, they would change the title and give it to director Jaume Collet-Serra (“Unknown” and “Non-Stop”). It would likely star Jodie Foster as the tightly-wound surgeon, Denzel Washington as the criminal and Liam Neeson in the role of the pursuing inspector. Is that necessary? Absolutely not. Despite how it delivers a highly-entertaining viewing experience, “Three” is the kind of film that will last a week in one theater here in Chicago, but do well On-Demand or streaming services. North American distributors still don’t know how to market these films or find the audiences that admire them. So, it’s left to folks like me.